I am here today to talk about cake. Because cake, if you ask me, is essential. Life is hard and busy and often confusing; the pockets of calm and perfect clarity are rare and short lived. Though the temptation is persistent, I’m determined not to wait for vacations and date nights and holidays and the achievement of lofty goals to enjoy life. We need routine and everyday life to sparkle, too. Enter cake, preferably during the day. My love of simple cakes is well and thoroughly documented, so perhaps you could wonder what more I might have to say. Forgive any repetition, but here I go again. In my opinion, afternoon is the ideal time for cake. In many other countries, they understand this, but here in America, we lag behind. Sure, I love to have something sweet at night, but I usually reach for dark chocolate, dates, citrus in winter, berries in summer. At this point, I certainly hope to be satiated from dinner. In the afternoon, however, when one is feeling peckish, deep into the day’s work, perhaps desperate for a break, in need of something warm and/or caffeinated, cake is the remedy. I’m trying to be more intentional about both rest and inviting people into my home this year. I’ve never been good at pausing from work and to-do lists but know this is an essential practice, one I’d regret not cultivating. And as for the latter, I love hosting and cooking for others, and it brings me tremendous joy, but I too easily hesitate—I don’t have time to tidy up, I should make an elaborate meal, I want to plan ahead, I have other things to do. But these are rather silly excuses in the face of something joyful, life-giving, communal. And so, I’ve been inspired to host friends for Sunday afternoon cake. Not only does this involve both rest and hosting, but it also has the benefit of not necessarily lasting all night—because the truth is that sometimes we do not have time for six-hour dinner parties, and also some of us do not have dishwashers. There is much talk of cake in Luisa Weiss‘ lovely book, Classic German Baking. Germans understand the importance of cake. They even have a name for the afternoon coffee break, God bless them: Kaffeezeit, or “coffee time,” where cake plays a starring role. All of this makes me very proud of my German heritage, and perhaps explains something about this obsession. WELL! Apparently, this whole cake thing runs deep in my German blood. Or rather, it has married with the bit of British in me, and the collision of tea time and Kaffeezeit has created something unstoppable. 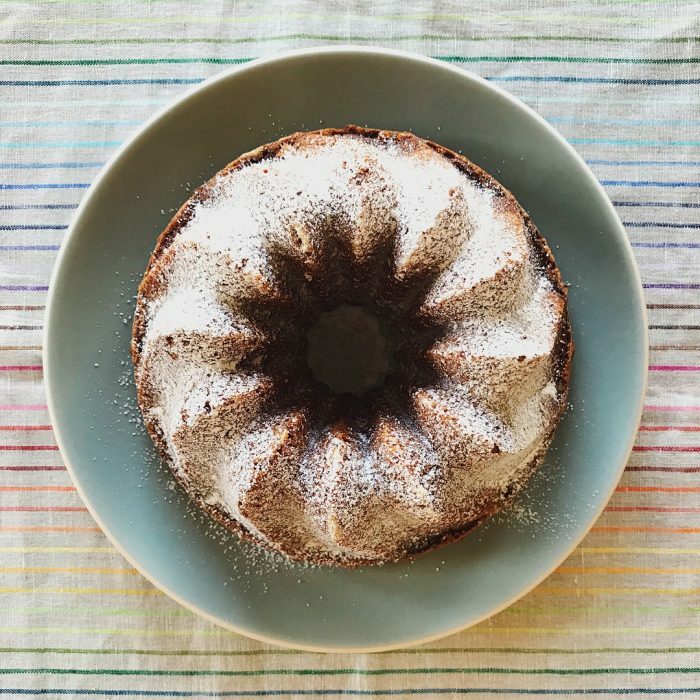 I did know enough about German tradition to turn to Luisa’s book—which is full of gorgeous simple cakes—when I decided that I wanted to instate a Sunday afternoon cake tradition. Way back in 2015, I tested some recipes for Luisa while she was working on this cookbook. One was her Gugelhupf cake, and I’ve wanted its namesake pan ever since. A couple of weeks ago, full of weekend cake fervor, I ordered one and went straight to this marble cake. I love its dramatic peaks and swirls, its heartiness and restrained sweetness and glorious crumble. We ate this on a Sunday afternoon with dear friends, passing around their baby as the sun sank down, lingering long enough to pop open a bottle of pink bubbles, rested and happy and full. The mention of white chocolate made me hesitate, but Luisa explains in the headnote that this doesn’t make the cake taste of white chocolate but instead adds a richer, toastier quality to the white cake—I found this to be true. I am a bit of a novice at swirling marble cakes, but I think it’s actually rather hard to make a mess of this, so don’t worry too much. This cake benefits from a rest, so you can make it one day before serving if you like. Leftovers will keep, wrapped tightly in plastic, for three days at room temperature. Preheat the oven to 350 degrees F, placing the rack on the bottom third of the oven. Generously butter and flour a 9-inch Gugelhupf or Bundt pan. Put the bittersweet and white chocolates into two separate heatproof bowls that can be set over a small saucepan of simmering water. Melt the chocolates, one bowl at a time, over gently simmering water. (You can also melt the chocolates in the microwave.) Set aside to cool. Place the butter in the bowl of a stand mixer fitted with the flat beater attachment. Add the sugar and salt and beat until light and fluffy. (Alternately, a handheld mixer will work just fine here.) Beat in the vanilla extract and then the eggs, one at a time, scraping down the bowl after each addition, until the mixture is well combined. In a separate bowl, whisk together the flour and baking powder. Beat the flour into the butter mixture. Then, scrape out two-thirds of the batter and place in a medium bowl. Stir the melted white chocolate into this larger batch of batter until no streaks remain. Add the melted bittersweet chocolate, cocoa powder, and milk to the remaining one-third of the batter, beating until fully combined. Scrape half of the white batter into the prepared pan. Top with the bittersweet batter, then the remaining white batter. 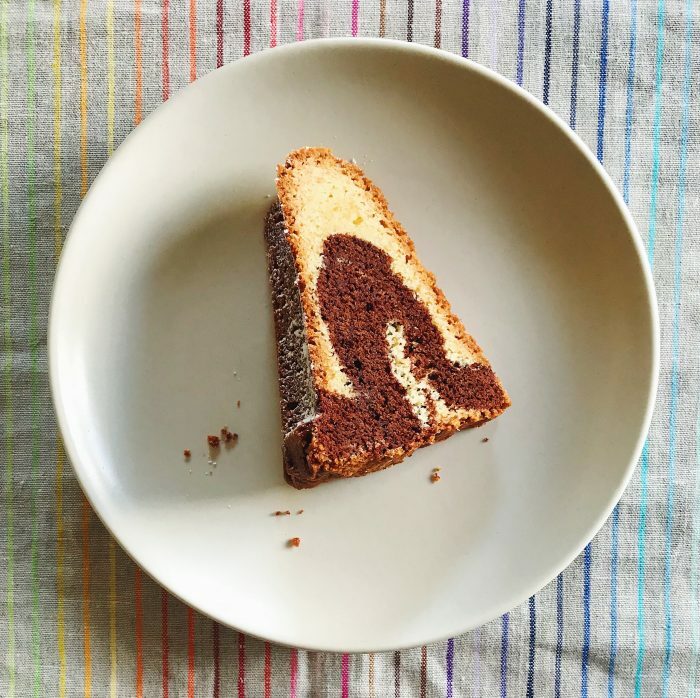 Using swooping motions, drag the blade of a knife through the batter to create a marbled cake. Smooth the top with an offset spatula. Place the pan in the oven and bake until the white part of the cake is golden and a tester comes out clean. This will take about 60 minutes in a Gugelhupf pan but closer to 45 minutes in a Bundt pan. Place the pan on a rack to cool for 10 minutes before unmolding the cake onto the rack. When the cake has cooled completely, dust with confectioners’ sugar, if desired, and serve. I love your writing, Stacy. You had me at “Cake is the Remedy.” I am going to adopt your attitude and have friends over for Sunday evening cake and movie night!